The scope of the textile and professional clothing industry means that the issue of sustainability has long been a problem with a dire need for a solution. As one of the largest industries in the world, the professional clothing trade body has a responsibility to practice sustainability wherever possible. Using sustainable practices means that businesses in the workwear, corporate clothing, PPE and many more, can have a substantial effect on the world environmentally, economically and socially. The benefits aren’t only outside of the businesses as sustainable practices also usually mean reduced costs. The PCIAW® considered it vital to have an expert on the issue of sustainability presenting at the PCIAW® Summit on the 18th June 2019, at the Montcalm Marble Arch, London. We are therefore delighted to announce Cyndi Rhoades, CEO of Worn Again Technologies, will be presenting on ‘A circular future for the Professional Clothing Supply Chain is on the horizon’. With Cyndi and her team’s intense determination to find a solution to the problem of textile waste, Cyndi’s presentation will raise awareness of the issue of sustainability within the planet and how professional clothing businesses can make the change to more sustainable practices. 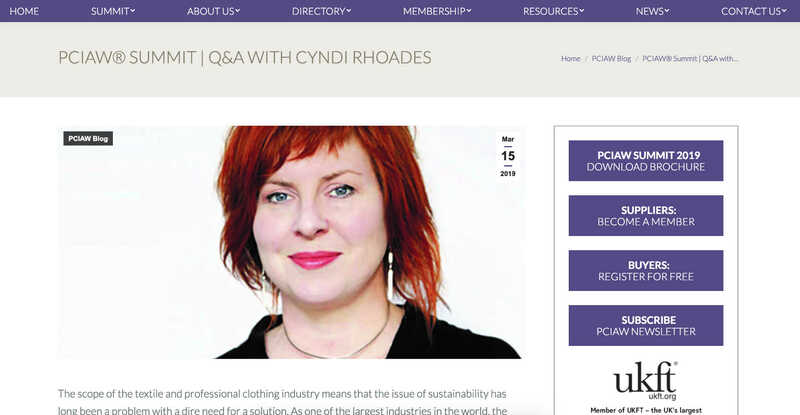 What drove Cyndi to seek improvement in regards to textile waste through the supply chain of the industry? Cyndi began her career as a filmmaker in music videos and documentaries which over time evolved into a deep interest in the impacts of commerce and global economics on society and the environment.